Upper Princess Falls, also known as Princess Falls and Lang’s Falls, is 7 metres (23 feet) in height and is located on Lang’s Creek, which is a tributary of the Chedoke System. It is a complex cascade and ribbon falls, and experiences impressive flow after rain and the winter snow melt. 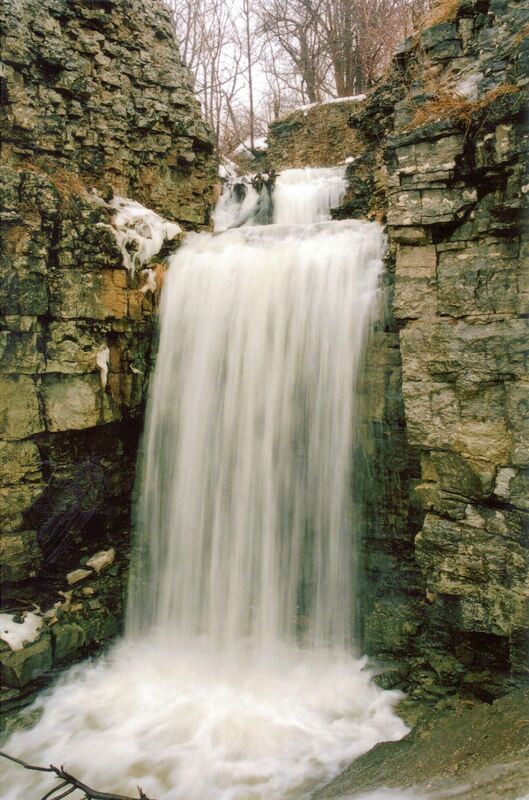 This waterfall is featured on the poster “Waterfalls of Hamilton Seasons” with a winter scene and is called “Westerly Falls on Chedoke Radial Trail” because at that time, its correct name was not known. It is not known how or when the name of Princess Falls came about. 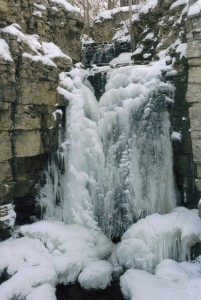 Upper Princess Falls is located on the upper side of the Chedoke Radial Trail. If a person standing in front of Upper Princess Falls turns around, he or she could see Hwy #403 and the top of Lower Princess Falls. To reach Upper Princess Falls, from Hwy 403 take the Lincoln Alexander Parkway east to Hamilton. Exit on Mohawk Rd., turn left at light (onto Mohawk) and proceed to Scenic Drive. Turn left on Scenic Dr. and travel for 1.5 km to where Scenic Dr. takes a 90 degree bend and on the left side is a small parking lot. From the parking lot look for the entrance to the Bruce Trail and the Chedoke Radial Trail, then follow the combined trails eastward for about five minutes to Upper Princess Falls. 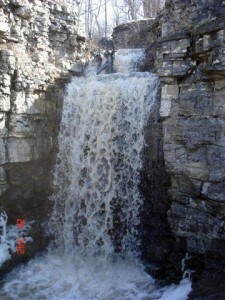 Many of the waterfalls in west Hamilton are accessible from the Chedoke Radial Trail. It is built on what was once the route for the Brantford and Hamilton Electric Railway owned by the Cataract Power Light and Traction Company (later Dominion Power and Transmission). This particular railway began service to the neighbouring communities of Ancaster in 1907 and Brantford in 1908. By 1931 other kinds of transportation had become more popular than the train. thus on June 30, the train took its last trip to Brantford with the same cars that had been used on the first trip in 1908. The tracks were removed the next year and the land as far as Ancaster was given to the Hamilton Parks Board in 1938. The 2.7 km strip forms part of the Bruce Trail. In 1995/96 the City of Hamilton developed the Chedoke Radial Trail for walking and cycling (and now waterfall watching).